On the 3rd (Wed), admire the natural beauty at Jardim Botânico do Rio de Janeiro, explore and take pictures at Maracanã, and then listen to music at Theatro Municipal do Rio de Janeiro. Keep things going the next day: stroll through Copacabana Beach, then kick back and relax at Pedra do Arpoador, then enjoy the sand and surf at Praia de Ipanema, and finally pause for some photo ops at Corcovado Christ the Redeemer. Find out how to plan Rio de Janeiro trip without stress by asking Inspirock to help create an itinerary. Brasilia to Rio de Janeiro is an approximately 2-hour flight. You can also drive; or take a bus. 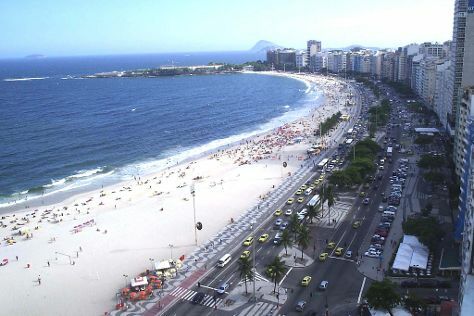 Traveling from Brasilia in July, plan for somewhat warmer nights in Rio de Janeiro, with lows around 22°C. Finish up your sightseeing early on the 4th (Thu) so you can travel to Sao Paulo. On the 5th (Fri), tour the pleasant surroundings at Ibirapuera Park, admire the masterpieces at Pinacoteca do Estado de Sao Paulo, and then get your game on at Pixel Realidade Virtual Arcade VR. Keep things going the next day: see the interesting displays at Museu De Arte Sacra De Sao Paulo, browse the fresh offerings at Mercadao - Sao Paulo Municipal Market, and then wander the streets of Paulista Avenue. To see photos, other places to visit, where to stay, and more tourist information, you can read our Sao Paulo online route builder . Fly from Rio de Janeiro to Sao Paulo in 1.5 hours. Alternatively, you can do a combination of flight and bus; or drive. Expect slightly colder temperatures when traveling from Rio de Janeiro in July; daily highs in Sao Paulo reach 26°C and lows reach 15°C. Wrap up your sightseeing on the 6th (Sat) to allow time to travel to Seoul. On the 8th (Mon), get engrossed in the history at National Museum of Korea, then tour the pleasant surroundings at Cheonggyecheon Stream, then get engrossed in the history at The National Folk Museum of Korea, and finally step into the grandiose world of Gyeongbokgung Palace. Here are some ideas for day two: make a trip to N Seoul Tower, then take in nature's colorful creations at Namsan Park, then explore the historical opulence of Changdeokgung Palace, and finally explore the historical opulence of Deoksugung. For other places to visit, where to stay, maps, and other tourist information, read our Seoul vacation builder site . Getting from Sao Paulo to Seoul by combination of flight and train takes about 29 hours. Other options: do a combination of bus, flight, and train. The time zone changes from Brasilia Time (BRT) to Korea Standard Time (KST), which is usually a 12 hour difference. Plan for somewhat warmer temperatures traveling from Sao Paulo in July, with highs in Seoul at 34°C and lows at 27°C. Wrap up your sightseeing on the 9th (Tue) early enough to travel back home.